In the section "Pages" (or Links, or Categories) tick the page for which you want to create an item of menu and click the button "Add to menu" (your selected item of menu will be added in the section "Menu Structure"). Click the caret (arrow down) next to the title of added item of menu, all settings of this menu item will be unfolded. Customize this menu item according to your requirements. Save the changes in Menu Structure ("Save Menu" button). Select the fonts to be included on the site. Remember that a lot of fonts affect on the speed of load page. Always remove unnecessary fonts. Here you can add and edit highlighting styles. After that you can select this styles for menu item in "Style of This Item" option. You can add custom raster icons. After saving these settings, icons will become available in a modal window of icons selection. Recommended size 64x64 pixels. This field is needed in the case when your template has a particular menu location and it needs adjustment. You can place here any necessary custom CSS properties. If this option is enabled, then the menu will be transformed, if the user uses the handheld device. This option is recommended to use only if styles of the installed theme interfere with the proper display of Mega Main Menu. If this option is checked - all CSS properties for this plugin will have "!important" priority. If this option is checked - all menus will be replaced by the mega menu. This will be useful for templates in which are not defined locations of the menu. Dashboard ► Appearance ► Menus Toggle the item of menu which you want to set. 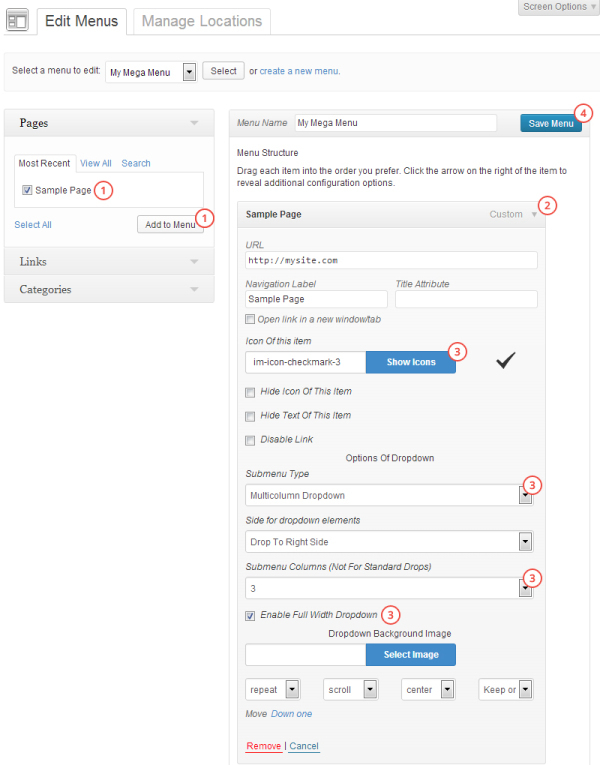 Standard WordPress settings of the menu item. We will leave out the explanation associated with standard WordPress settings of the menu item as they are very simple and understandable. We will consider opportunities of the Mega Main Menu instead. icon of the current menu item. Click the button "Show Icons". In the modal window that appears, click the icon that you prefer. Click the button "OK" in the upper right corner of the modal window (if you click outside the modal window - icon selection will be canceled and the modal window will be closed). Notice: the plugin includes a set of more than 1600 vector icons, so loading a modal window can take some of your time and patience. Hide Icon of This Item. Use this option if you want to display the menu item without an icon. Hide Text of This Item. Use this option if you want to display the menu item without a text. For example, link to the home page can be displayed without a text, and only the "Home" icon can be left. Use this option if you want to set up the menu item without an active hyperlink. For example: it can be the title for the column in multicolumn dropdown menu. Notice: these settings can be adjusted only for the first level items of the menu, and the style of displaying all children dropdown elements will depend on these settings. Use this type to display usual dropdown menu as one column. Use this type to display dropdown menu with several columns. Number of columns depends on the option "Number of Columns". 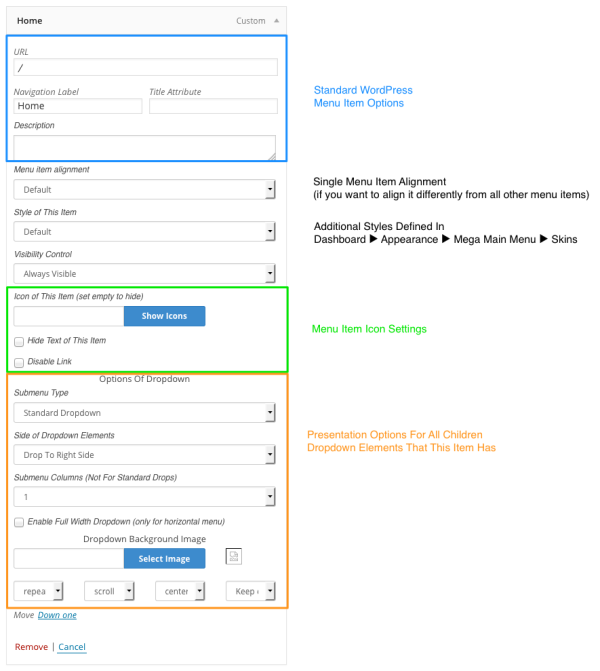 Use this type to display dropdown menu in the form of a grid using recently added posts. Number of elements placed in one line depends on the option "Number of Columns". Thumbnail picture and icon for each post are selected on the page of editing this post (Look for "Featured image" and "Post Icon" Metaboxes). Use this type to display dropdown menu with Widgets. Select number of columns with the help of the option "Number of Columns". Using this type you can add and edit widgets in the usual place (on page Dashboard ► Appearance ► Widgets). Just choose the side to which dropdown elements will unfold. For example: if you set "Drop To Right Side" for this option then dropdown will start at the left side of the initial element and go beyond it to the right. 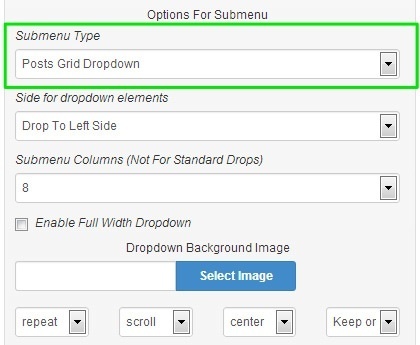 This option influences the number of elements in one line for "Grid Dropdowns", the number of columns in the "Multicolumn Dropdown" and "Widgets Dropdown". 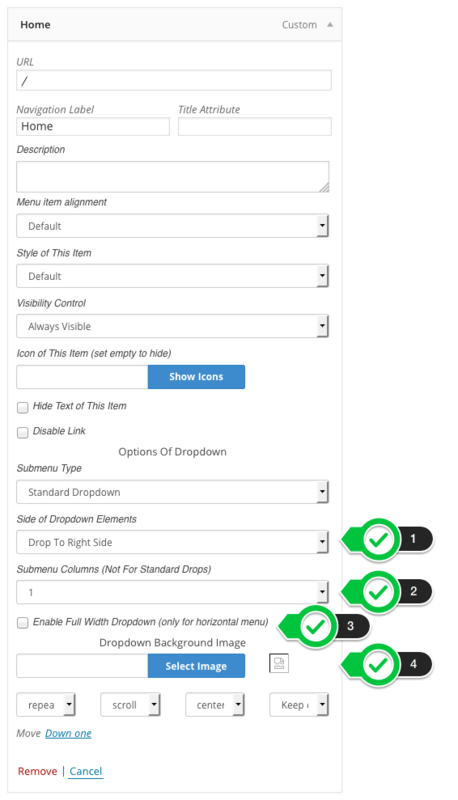 If you check this option the dropdown menu will be stretched to the full width of the primary container. Use this area to select and set parameters of the background image for the dropdown item.